While it’s always a good idea to have a blog for your business, getting other blogs to post about your product or online shop is not only super flattering; it’s also a great way to tap into their audience to promote your stuff! But anyone who’s tried emailing everyone from bloggers to journalists knows that more often than not, you get radio silence before you even get a “no thank you.” Here are some helpful guidelines, examples, and an example email you can copy, paste, and make your own to help you master how to get bloggers and influencers to promote your product. Bloggers get a lot of “feature my cool online shop!” type requests, so it’s better to take some time to prepare before cold-emailing a blogger rather than burn bridges before they’re even made! Here’s what you gotta do to know what you’re going to offer them, know what you want, to become familiar with the blog, and to get prepared. Reaching out to finance bloggers about your Artist Shop full of movie parody designs won’t do you much good. Seek out and contact bloggers with the audience you’re trying to reach. This will help get your product in front of people who are more likely to be interested in it, and is also more likely to pique the blogger’s interest. There are lots of resources for finding relevant blogs (like here and here), but Googling “Foodie Blogs”, “Geeky Blogs”, whatever theme is relevant to your product is a good starting point! Some blogs make contacting them as easy as clicking a button. But others require a little detective work. If you can’t find a way of contacting them on the site, check for contact info through their social channels. Sometimes bloggers are even open to people sliding into their DMs (but make sure they encourage that). For bigger blogs with a list of editors and content managers who run the site, try reaching out to a few of them first vs the head honcho. They’re sometimes easier to reach than the head honcho. Lifehacker said, “one reason this wonderful idea [of emailing bloggers] isn’t working the way it was expected to is that while bloggers have something pretty valuable to offer marketers, marketers so far have had little to offer in return.” It’s great for you if a blogger features your Artist Shop! But Bloggers have a lot to lose if their audience isn’t into it. Give them an enticing reason to work with you. 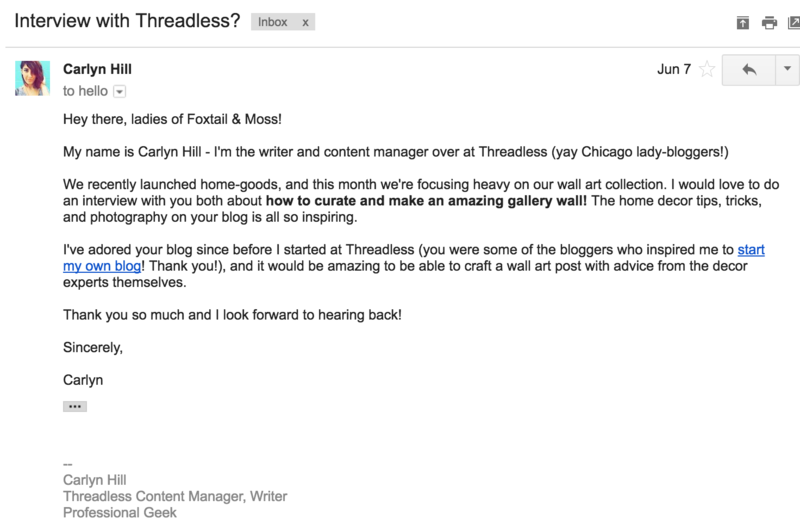 For example, I reached out to the Foxtail + Moss blog to see if they’d want to do a “How to Make a Gallery Wall” post for Threadless. I ended up offering them their pick of 5 art prints free of charge to use for the post and, of course, that we would share the post on our social channels. The post turned out great, they were thrilled to work with us and got some fun new prints out of it! Having a few posts that you’ve written or having your stuff featured/reviewed on other smaller blogs 1: gives you some credibility and shows you’ve worked with people before, 2: gives you posts to link to in your email, and 3: is good practice before reaching out to a bigtime blogger. Harsh truth: if someone reaches out to me and it seems like they haven’t taken the time to read my stuff, I’m less inclined to work with them. Mentioning a few posts you really like or that you like my writing style shows you’ve taken the time to get familiar with my blog, which means a lot! And it helps you understand their tone as well. If they’re super formal, better to pitch to them formally (simple as dropping a “Hey there!” for “Greetings!”). If they’re laid back, pitch to them in a friendly way (while still keeping it professional). Reading up on a blog you’re going to pitch to beforehand will also help you figure out what kind of post ideas and offers appeal to them, if they’re even actively posting on their blog anymore at all, and will save you the awkward moment of pitching a post they published something similar to just recently. One way to show you’ve read up on someone’s blog? Get involved! Comment on posts, share them, like tweets, follow them on social media, etc. Showing that you’re actually interested in their content goes a long way. Just don’t overdo it. Get engaged, not stalkery. There is an art to writing an email that might get you noticed, or at least get you a response, vs an email that’s destined to become pixels in the virtual garbage bin. My rule when I’m reaching out is to wait a week or two to give them time to respond. Then if they don’t, just to send a follow-up reminder email checking to see if they got your message. If that goes unanswered, back away. You can try again in a few weeks, maybe even months, but you don’t want to burn a possible bridge later by being a nuisance now. If I get an email that seems like it was copy/pasted into an email to 12,000 other bloggers, I’ll usually delete it. 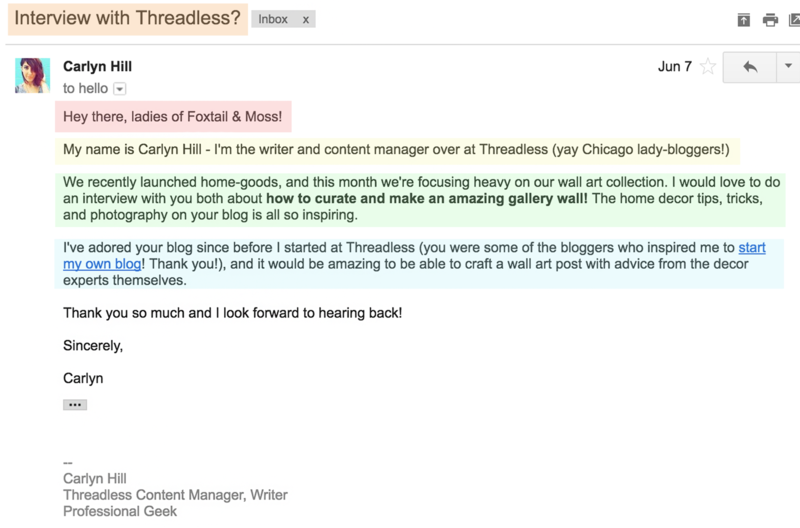 Personalize your email to every blogger you email. You can use the same structure for all of your emails, but tailoring that skeleton to each blogger by putting some meat on it (mentioning a post you loved or that you related to, that you went to the same school, etc.) makes us feel special and makes you seem more like a person as well! It’s also really easy to get a little too comfortable or personal or too joke-y (jokes sometimes don’t always translate well through email). Remember, no matter how chill a blogger you’re talking to seems, always keep things professional. Saying “write about my Artist Shop” doesn’t make you stand out. But if you send an email with a post idea or two (a gift guide, a gallery wall how-to featuring your art prints, some really cool lifestyle photography of your product that I’d want to share or use in my pieces, etc. ), some of your merchandise to use in a giveaway, or even an already written piece about your product, then you’re offering us potentially really cool content for our audience. On the other hand, bribing? Not cool, and kind of shady! You can offer them a gift after they’ve written about your product, but don’t bribe them to get them to write a positive post. Do make an offer I don’t want to refuse! Don’t, you know…go full-out Godfather. Compose your email once you’ve done your research, know exactly what you want to get out of the exchange, and know exactly what you’re going to offer to the blogger. It’s better to be direct and sum up your pitch in a few sentences in the middle of the email rather than stumble around for a paragraph. But don’t be demanding. Don’t box them in creatively, or come off as “you’re an idiot if you don’t talk about my life-changing product.” Be genuine, be kind, and be direct but be friendly. Remember, their voice has influence; you don’t want to make that voice mad. DO grammar check, DON’T skip that grammar check! I’m not gonna say that if I see a “you’re” used wrong or spelled “yuo’re”, I’m going to be less inclined to read your email…but if I see a “you’re” used wrong or spelled “yuo’re” I’m going to be less inclined to read your email (which is also great dating advice, #TheMoreYouKnow) It’s not about being a grammar snob – it’s about seeing if you’ve taken the time to actually carefully check your email. SUBJECT LINE: This subject line tells them exactly what I’m asking for and poses it as a “would you be interested?” question. FRIENDLY GREETING: “DEAR MADAM AND/OR SIR” or “Dear Ms./Mr.” is a little formal, especially when you’re not sure who will receive the email in a multiple blogger situation. Being friendly and inviting. FRIENDLY INTRO: Introduce yourself and what you do. This is also a good point to throw in something that connects you to the blogger – really enjoying a specific blog post, being a fellow Chicagoan female blogger, going to the same school, etc. TYING IT ALL UP: This is admittedly a little more personal than I would write to a typical blog, and probably as casual as I would feel comfortable getting in an outreach email. But it is nice to do a little wrap-up and talk about how you would love to work with them and tap into their expertise, fellow geekiness, etc. EMAIL CONTENT: Keep it short, consise, to the point, and sweet! Hey there, [Blogger’s name or, if they’re a total ghost or it’s not specific which of the Blog’s writers it will go to, “people of BLOG TITLE”]! My name is [your name], I’m a [your title] at [where you work – link to it!] I recently discovered your blog and have been reading it like crazy! I really enjoy your voice. Your post about [mention a specific post here] really spoke to me [sum up why a certain post stood out to you in a sentence – remember, personalize but don’t get too personal. Keep it short, sweet, and about them]. I would love to work with you and create a “10 Ways to Wear a Geeky Graphic Tee” post for your blog featuring designs from my Threadless Artist Shop, “[name of shop, link to it],” if you’d be interested. If you’d like to take some lifestyle shots with my product, I’d be happy to send you some samples. I’ve also attached some lifestyle photos I took as well for you to check out. Thank you so much for your time and let me know if you’d be interested! And of course, if you have a different direction you could take a post, feel free to do so! You’re the blogging expert here. Once you’ve connected with a blogger, don’t just fall off the radar! If they post about you (even if it’s just a promo tweet), share their social posts about you across your social media as well! And remember: don’t get discouraged. You’ll get a lot of non-responses. But you’re bound to get some bites! Sources for this article and resources for YOU! Great article Carlyn! In your email template, I noticed a sentence: “I recently discovered your blog and have been reading it like crazy! I really enjoy your voice.” Isn’t this is a bit far-fetched? I mean, experienced bloggers probably seen dozens of similar templates. As such, they probably stopped trusting such pitches somewhere along the way. Hey there, Stefan! Thanks for commenting! You make a good point! Just like the email is just a skeleton for people to build on, I have that sentence there as more of a guideline – you’re right, just saying that sentence alone is very pitch-y (and as a blogger myself, I’d look at that sentence by itself and cry ‘cut and paste pitch!’ from a mile away), but saying something in the same vein and then expanding on it by talking about specific articles you enjoyed by them or a particular aspect of their voice makes it clear that it’s not just a cut and paste line and that you took time to get to know their work! (The Foxtail and Moss email I have up there is a good example of how you can take the concept of saying “I recently discovered your blog/I really enjoy your voice” and make it specific and personalized). Hey Carlyn! You got some awesome tips here. I was wondering if you build up your relationship through social media first? Or do you believe that a brilliant pitch can do the job alone? Good question! I think it depends on the person you’re trying to reach out to. If it seems like they’re someone who is open to and actively builds relationships with customers/potential outreachers on their social media, then I say definitely build the relationship there first! Overall though, it never hurts liking/commenting on posts and tweets – it shows that you’re actively involved with their material. I would advise against OVER-commenting/liking on social media, or doing it all at once and then reaching out – the first of those can get a bit annoying, the second just seems a little fake-y! Blog post outstading,Thank you so much. So, how would I contact you? We’re launching a site that is designed specifically for small business to market themselves and your subs may find very useful. I have something awesome for you in return, but I can’t find a contact email, lol. …Like split the profit with them….. Don’t be greedy remember, give before you take…. I have a website https://whitelight.social/ which I want to promote. Let me know if you can help me.